We invite you to experience the world's greatest airshow from centre stage, in the luxurious and stylish surroundings of the Lightning Pavilion. 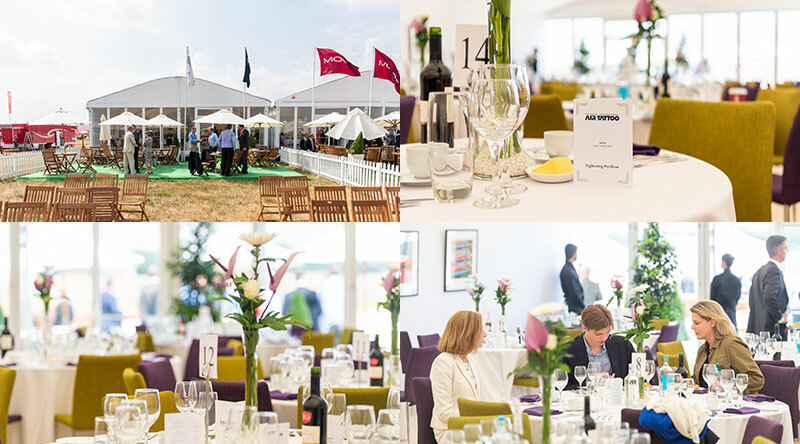 As well as 5-star hospitality throughout the day, Lightning Pavilion guests will have their own private garden, just 100 from the runway, with the best seats in the house to watch the awe-inspiring flying display. The Lightning Pavilion is perfect for discerning customers who enjoy the finer things in life. Suitable for both business and social groups, tables seating between 2 - 12 can be purchased. All catering is provided by Tapenade, winner of Event Caterer of the Year awards in 2017 (Food Service Catey Awards) and 2018 (SLC Awards). To book Lightning Pavilion please call Ali Bray on +44 (0)1285 713300 ext 5326 or email ali.bray@rafcte.com. To compare the Lightning Pavilion with our other enclosures, please click here.